Outer Reef Yachts of Fort Lauderdale announces today the introduction of its newest model, the Outer Reef 720 Deluxbridge™ Long Range Motoryacht (LRM). This new model for the company is the culmination of years of experience in building semi-custom Motoryachts, philosophically driven by continual refinement as well as client input and requests. The new 720 Deluxbridge™ LRM features an enclosed pilothouse and lounge with port and starboard wing stations in place of the builder’s traditional open flybridge. This allows for a huge “Country Kitchen” on the main deck in place of the standard lower steering station and pilothouse. The lower accommodations will feature 3 ensuite staterooms with a full beam master stateroom amidships with a full king berth. Aft accommodations will feature 2 staterooms with full head and shower, a mini-galley and laundry center for crew or guests. The aft accommodations can also be configured with many optional layouts such as a workshop in lieu of a second stateroom. Access to the aft accommodations is from the salon making this part of the interior living space and not an afterthought due to limited access. 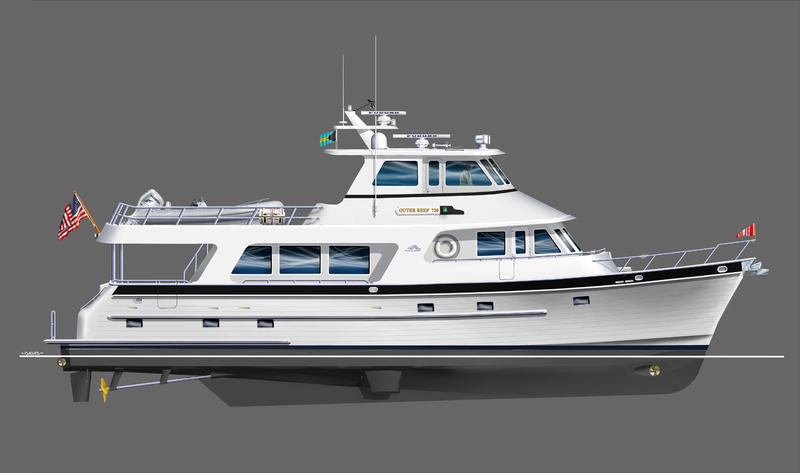 Much emphasis is put on exterior living space with a new and improved expanded aft deck, a new European transom with flared stairs to the bathing platform for increased access for water sports and diving, and an enlarged boat deck that can accommodate a sports tender up to 20’ in length. The first 720 Deluxbridge™ LRM will debut at the 2012 Ft. Lauderdale International Boat Show.